Philips Air Purifier (Model #AC1215/20) Review: With constantly growing air pollution across major Indian cities, buying an air purifier has become a necessity than a luxury. 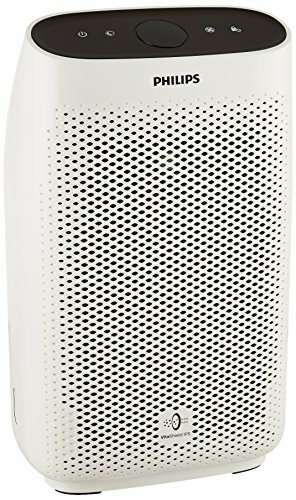 We have got our hands on the entry level air purifier AC1215/20 from Philips and here’s whats on offer. Philips AC1215 air purifier is an entry level model with good specifications, design and decent performance. Philips has packed the device with essential features like Auto mode, Child lock, Real time air quality feedback etc. Design: While it is true that beauty is in the eye of the beholder, this device does look really neat. Sleek lines, a honey comb structure on the front, neat black touch panel at the top and elegant finishes make this device look great. However, buyers do not have multiple choice of colors to choose from and the air purifier is only offered in white color. The black touch panel is quite simple with options of power icon, night mode, fan speed and child lock, the circular digital display shows the status of the device. The air purifier is ideal for bedroom use and the compact design helps in portability between rooms without occupying much space. Technology: Philips air purifier AC1215 is equipped with HEPA air filter, the mystery word HEPA which stands for High Efficiency Particulate Air. Glass fibers are used to make HEPA filters and their unique configuration makes sure that large contaminants such as mold, dust and allergens are captured. HEPA filters can collect 99.9% of airborne impurities that are larger than 0.3 microns diameter. It is important to know that HEPA filters do not deal with nasty smells or odors. Anyways, back to Philips AC1215, the device is equipped with a pre filter and a HEPA filter. The pre filter helps to filter larger airborne impurities. The special auto mode can constantly monitor air quality levels and remove pollution. NightSense mode enables the device to rapidly prepare the bedroom air for sleep and constantly monitors the air quality. The healthy air protect alert lets you know when it is time to replace the filter. The smart air sensor can detect PM2.5 levels and boost the air purifier’s speed to deal with the pollution. inconsistent by indicating poor air quality even though the air quality is actually good. Constant cleaning of moisture with a dry cloth is required for the device to show accurate results. Maintenance: Philips recommends periodic cleaning of the pre-filter when the device displays ‘FO’ on the screen, there isn’t a predefined interval as the filter life depends on the air quality. HEPA filters will need to be replaced on the end of its lifetime and the air purifier will stop functioning if the filters are not replaced in 14 days. The pre filter costs approximately Rs. 1000 + and the HEPA filter around Rs. 2295. Air purifier AC1215 is delivered with a 2 year service guarantee for any faulty parts. Conclusion: Philips air purifier AC1215 is a great all round device with good features, competitive price and excellent value. There are a few factors that could hinder you from choosing Philips air purifier AC1215, lack of carbon filter and the short life span of filters which are expensive to be replaced. However, if you are looking for a basic portable air purifier that suits your bedroom, Philips air purifier AC1215 will be the perfect choice for its good features and with its affordable price tag backed by brand Philips.